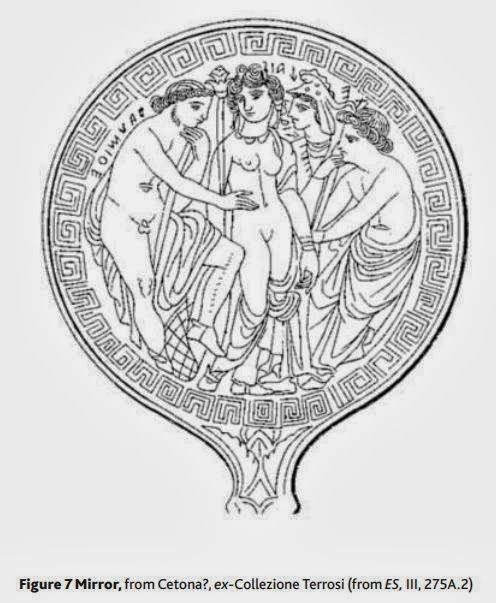 "From the linguistic point of view, Etruscan mirrors have been defined as figured bilinguals, whereby the scene with its details illuminates the meaning of the inscriptions. In contrast, from the iconographic and iconological point of view, there is often no ready association because characters with names that we instantly recognise in the Greek world assume different roles on Etruscan mirrors. This makes interpretation far from easy." There is a goddess of fate and stars named Nortia by Roman authors of which next to nothing is known save, that is, a few Roman accounts of time-keeping rituals using pegs or nails on the wall. Erika Simon makes an educated guess that the name used by the Etruscans themselves might have been *Nurtia, however such a name in Etruscan texts has never as yet been found. Even more absent is any analysis of the name itself. Lacking any additional information than the repeated tidbits printed and reprinted by Etruscanists, under what form should I put her name into my Etruscan language database? Should I just accept Simon's guess and think no further on it? Where does her name come from though? Shouldn't we explore possible sources of her name? Maybe this might flesh out who this divine personage is. Skimming through my own database, I notice a lot of ethnonyms ending in -te indicating origin, largely in family names (eg. Curtunte 'citizen of Cortona', Manθavate 'citizen of Mantua', Rumate 'citizen of Rome'). This suffix seems in origin to be Indo-European since there is another suffix in -χ that accomplishes the same job (eg. Rumaχ 'Roman'). It also turns out that there is a city named Nora in Sardinia that had been settled back in the 9th century BCE by Phoenicians. If the Romans and Greeks called the city Nora, we should expect *Nura in Etruscan given the lack of a distinct vowel 'o' in the language. Naturally if one were from Nora, one would be a *Nuraχ or *Nurate. The latter form is what made me wonder whether Nortia is merely an epithet meaning 'She from Nora'. In this case, a form *Nuratiia would be in order (using the Latin-borrowed feminine ending in *-ia) or perhaps simply *Nurate (since Etruscans lacked marked gender categories anyway). If so, this could just be an epithet perhaps for an existing goddess, say, *Uni Nurate. 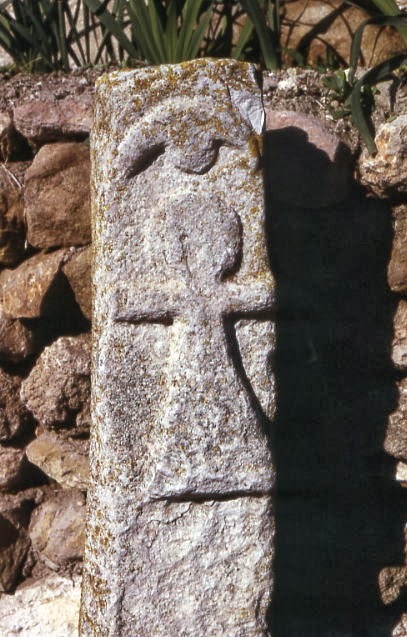 The goddess worshiped in Sardinia and Carthage was Tanit who coincidentally governed the sun, moon and stars. Tanit's carved representation is what you see at the top of this post.